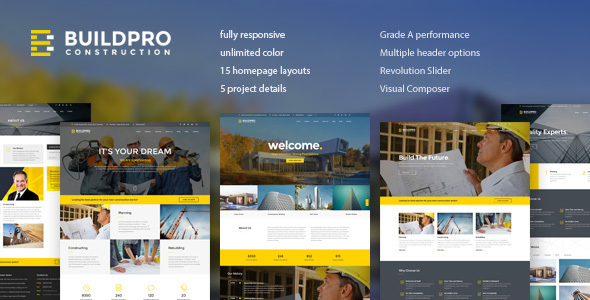 BuildPro – Business, Building u0026amp; Construction WordPress Theme – current version 1.0.8 available for download! - Latest Version 1.0.8 – 28 February, 2018 - WordPress Version 4.9.x Ready - WooCommerce Version 3.1.x Ready - Hosting Requirements BuildPro is a business theme designed specifically for construction, building companies and those that offer building services. The theme comes pre-packed with a drag and drop page builder (Visual Composer) to ensure you can easily design your website just how you like it. BuildPro is built with the latest web technologies (Bootstrap framework, LESS, icon font, etc.) with the care of coding quality to make sure the theme works with all browsers and all devices. Question before purchase? Compatible with WPML, WooCommerce 3.1.x, WooCommerce 3.0.x, Visual Composer 5.1.x, Bootstrap 3.x. BuildPro has been tested with browsers IE9, IE10, IE11, Firefox, Safari, Opera, Chrome, Edge.